The Emergency Broadcast Returns! 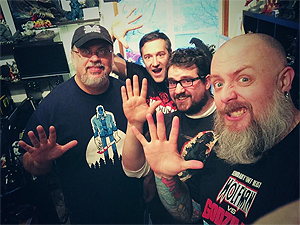 Jeff, Martin, Andy Campbell from Kaiju 101 and I broadcasted LIVE from the Kaijucast HQ for this 5th anniversary celebration! Wow! Episode 100 AND the anniversary of the Kaijucast’s FIFTH year? What a coincidence, right? Nah, I just planned it that way…strategically. We were very happy to welcome back to the show Chris Mowry of IDW Publishing to speak about the current series, Godzilla: Rulers of Earth. It’s been so long since our co-host Heather Brask has been on the show that we gave her a call and interrupted her family time in San Francisco. We spoke to Trae from the Justice In The Capital podcast about their Texas Toku Taisen crowd-funding campaign. And if that wasn’t enough, listener-turned-podcaster Andy Campbell from Kaiju 101 made the trip down to Oregon from Canada, eh? …just to be part of this show! This was a fantastic episode and I want to thank everyone for listening and participating. Big congrats to the seven winners from this broadcast: Matthew Jennings, Patrick Coakley, Ern(! ), Jonathan Westmoreland, Johnny Snyder, Scott Martin & Danny DiManna! I’ll be emailing you all about your prize packs as soon as I have everything in order. Remember that if you want to be included in the next Daikaiju Discussion episode, you need to watch Gamera Super Monster (1980) and send in your thoughts questions and reviews before January 25th!